Speakers led chants of "abolish ICE." Kara Hernandez's husband was detained by ICE in the Contra Costa Sheriff's jail for two months before he was transferred to a jail in Colorado. Next to her, Lourdes Barraza, fought for six months to free her husband from the Contra Costa jail. Several thousand protesters converged on the West County Detention Facility in Richmond today to rally against the anti-immigrant policies of the Trump administration. But protesters also connected the specific issue of family separation, which has unleashed a firestorm of criticism against the federal Immigration and Customs Enforcement agency, to broader criminal justice issues such as mass incarceration and cash bail. 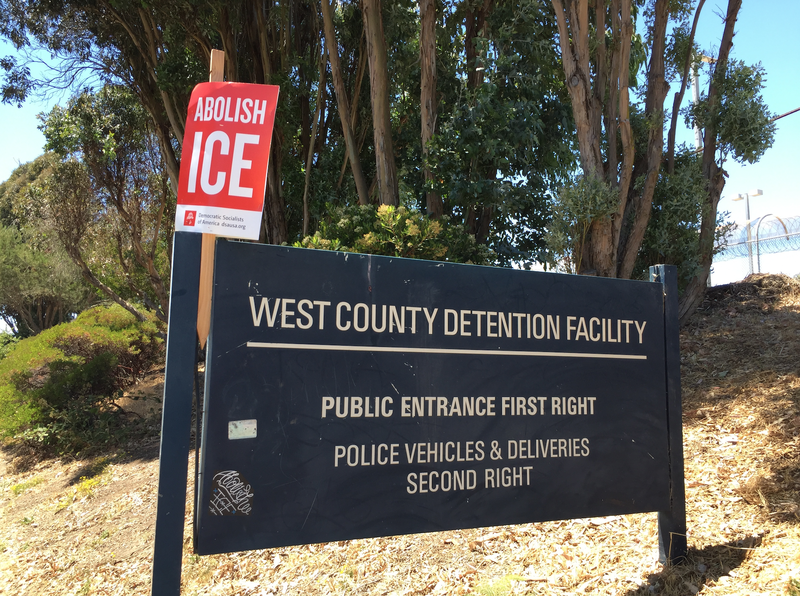 ICE pays the Contra Costa Sheriff's Department about $6 million a year to detain immigrants in the West County Detention Facility. Speakers led chants of "abolish ICE" and the crowd cheered for minutes at a time in hopes that detainees behind the jail's cinderblock walls might be able to hear their message of solidarity. 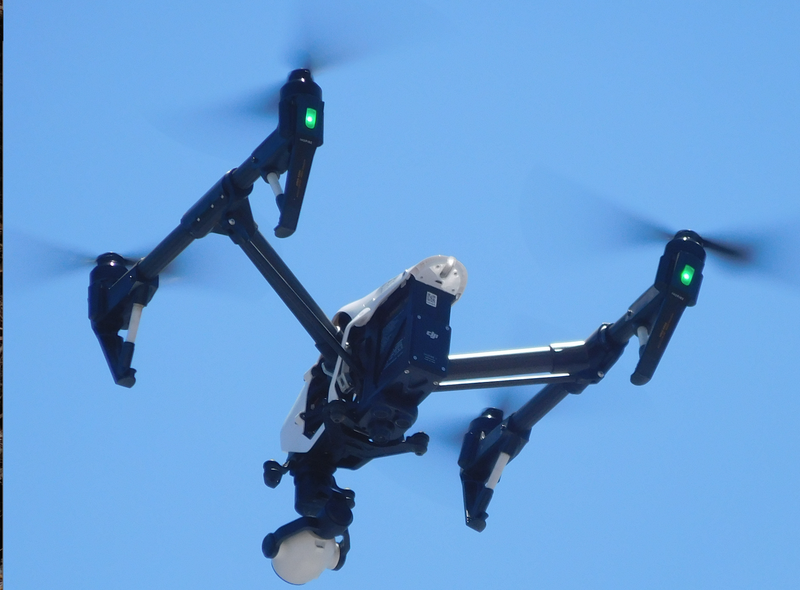 Meanwhile, deputies looked on from behind traffic barriers and atop the jail's roof while a drone piloted by the sheriff's department buzzed overhead. The notion of eliminating the controversial federal Immigration and Customs Enforcement agency seemed radical just a couple months ago, but the idea has gained traction after the Trump administration began separating children from their parents who are detained at the border, and implementing other measures as deterrents to migration. 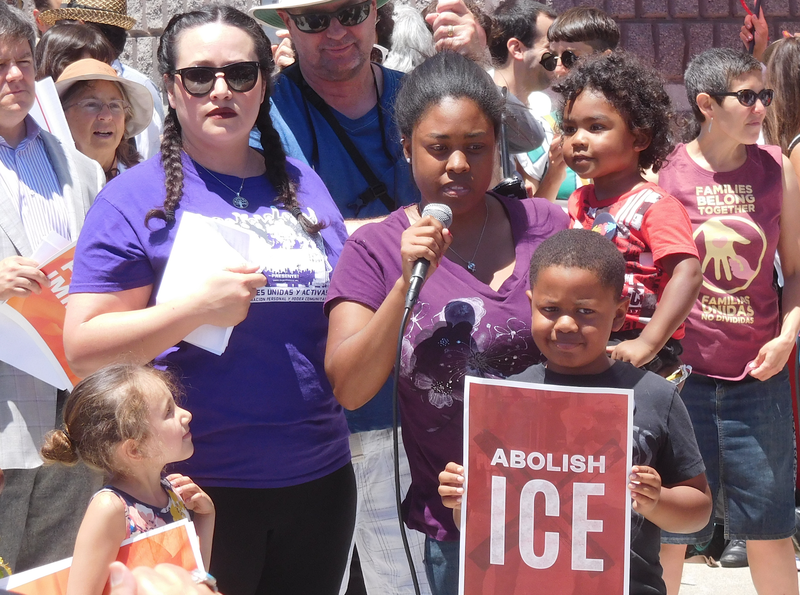 "We should be demanding that ICE be abolished and all its tentacles cut off," Juan Prieto, an organizer with the California Immigrant Youth Justice Alliance, said at today's rally. A sheriff's drone observed the rally from above. Prieto said, however, that immigrants have been scapegoated for years, long before Donald Trump's election, and that local law enforcement has been complicit in targeting undocumented people for arrest and deportation. Prieto singled out Contra Costa Sheriff David Livingston for the assistance he provides to ICE. For example, ICE pays Livingston's agency about $6 million per year to incarcerate immigrants who are facing deportation in the San Francisco immigration court and who are ineligible for bail, or cannot afford bail. The Contra Costa Sheriff's Office has also helped ICE set up ambushes to arrest undocumented immigrants. And Livingston was also one of several sheriffs in California who, earlier this year, began publicly posting inmates' release dates, as was Alameda County Sheriff Gregory Ahern. Immigration rights advocates claim that this policy is a purposeful strategy to exploit a loophole in the state sanctuary law known as SB 54, which prohibits local and state police agencies from communicating with ICE for the purpose of civil immigration enforcement. Several people who have had family members incarcerated in the West County Detention Facility also shared their stories today. Lourdes Barazza's husband, Fernando Carillo, was arrested by ICE agents one morning last October after he dropped their daughter off at daycare in San Jose. ICE sought to deport him because he allegedly entered the country several times on a tourist visa and over-stayed. While Carillo was detained in the Richmond jail for six months, Barraza would come to visit him. "At first, when I came, there were about 40 people outside," she said about several protest groups that have maintained a regular presence outside the jail in solidarity with immigrants. She said the thousands who attended today's rally shows that "people are understanding, they're mad, and they want to get involved." Assemblymember Rob Bonta said he has been "shocked and dismayed" by the federal immigration enforcement policy of separating children from their parents. Her husband was granted a withholding of removal earlier this year, a decision by an immigration judge that effectively allows Carillo to remain with his family in the United States. But Barazza told the Express after today's rally that ICE recently notified her family that the government plans to appeal the judge's decision and continue its effort to deport him. Kara Hernandez shared a similar story of being painfully separated from her husband. Holding one of their children in her arms, she said that he was arrested and detained in the Richmond jail for two months until he was recently relocated to a detention facility that ICE operates in Colorado. "He's been in this country since he was six months old," she said. "He was picked up on Mother's Day [by ICE]." 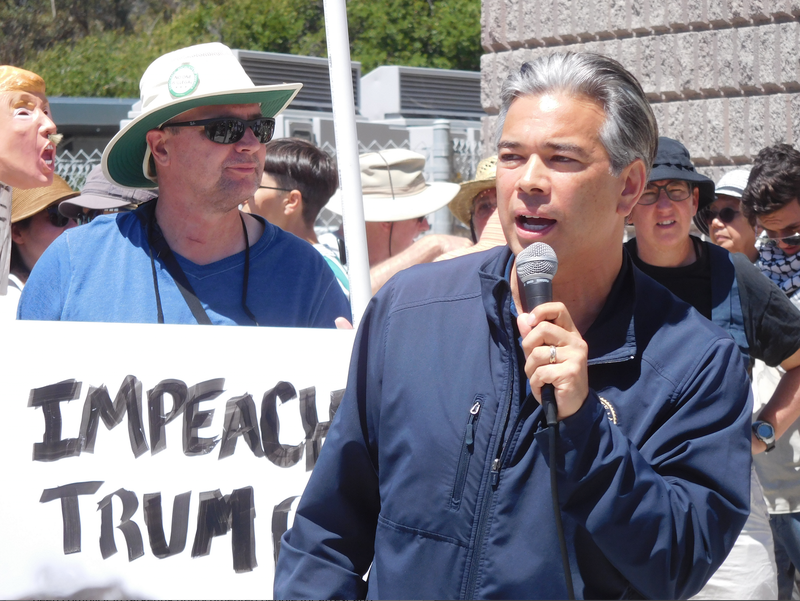 California State Assemblymember Rob Bonta was one of several elected officials at today's rally. He said that in addition to reforming immigration laws, it's necessary that broader changes be made to the nation's criminal justice system to address racial and economic disparities. Bonta specifically mentioned SB 10, a bill he's co-sponsoring that would do away with California's current cash bail system for defendants who don't pose a danger to the public, as a positive reform. Currently, the average bail amount is $50,000 for a range of offenses, many nonviolent, which translates into a requirement that an accused person pay $5,000 if they hope to gain their freedom before trial or hearings. As a result, two-thirds of California's jail population is incarcerated simply because they can't afford bail. "We need to change that," Bonta told the rally. "We have a broken criminal justice system, a money bail system." One of the organizers of today's protest, Sam Davis, said he was surprised by the number of people who showed up. Rodrigo Torres, an organizer with the group Freedom for Immigrants, was also surprised by today's turnout. "But the mood in the country has changed," he said. Correction: the original version of this story misquoted Kara Hernandez regarding the age of her husband when he first came to the United States. He was six months old, not six years old.